We shall first review the Simple Edge trigger and its limitations, and then explore the possibilities that advanced triggering offers. The trigger mode control tells the scope whether to wait for a trigger condition and what to do next. None, Single, Repeat and Auto modes work as in any other oscilloscope. Depending on the PicoScope model and timebase settings there may also be special modes such as Rapid and ETS (Equivalent Time Sampling). The trigger point is shown by the yellow diamond shape. It indicates the moment when the signal rises above the threshold voltage of 0.8 V. This method gives a satisfactory display if all the pulses are of the same shape and equally spaced. The square wave in this image represents the simplest type of signal produced by electronic circuits such as crystal oscillators and phase-locked loops. Most signals are more complex than this. In this waveform, the pulses are of unequal widths. If we use Single trigger mode, the scope will pick the first rising edge it sees. We happened to catch the rising edge of the short pulse in this case, but the scope could just as easily have started capturing on any of the other rising edges. If we were looking for a narrow pulse that occurred only once in every million normal pulses, then we would be very lucky to find it using this hit-or-miss method. In Auto or Repeat trigger mode, the scope captures continually many times each second. This image shows a number of waveforms superimposed, as you might see if the refresh rate is fast enough. This type of display is of little use if we want to see the data contained in the pulse train. The Advanced Edge trigger provides the standard rising, falling and dual edge conditions. Dual edge triggering allows you to check the widths and voltages of positive and negative pulses as the same time. It is useful for rapidly spotting jitter and noise problems, and for displaying eye patterns. Consider this very noisy signal. It is difficult to trigger stably on this signal with a normal rising edge trigger because it crosses the trigger threshold, the red line in this example, several times in one cycle. If we zoom in on the highlighted parts of the signal, we will see how hysteresis can help. In these zoomed-in views the original threshold is the lower red line. The upper red line is the second threshold used by the hysteresis trigger. The signal rises across the lower threshold at (1) and (2), arming the trigger but not firing it. At (3) the signal finally crosses the upper threshold, firing the trigger. On the falling edge of the signal, at (4) and (5), rising edges of noise pulses cause the signal to cross the upper and lower thresholds, but in the wrong order, so the trigger is not armed and does not fire. Thus the trigger occurs at only one well-defined point in the cycle, despite the noise on the signal. This trigger detects the moment when the waveform enters or leaves a voltage range. This allows you to search for overvoltages and undervoltages at the same time. In this example a 5 volt power supply is monitored with thresholds of 4.3 and 5.7 volts. The window trigger will detect both the positive and negative excursions outside this range. This trigger enables you to trigger exclusively on pulses with a specified range of widths. This can be useful for finding glitches, rare events in synchronous control signals such as write-enables, or extreme values in pulse-width modulated (PWM) signals. In this screenshot the trigger was set to “pulse width, positive, less than 20 ns”. This found a 19 ns pulse in a stream of 100 ns and greater pulses. This trigger helps you find missing or mistimed edges, or changes in signal frequency. The picture shows two examples of a 4 MHz clock waveform with a missing pulse. You could use a pulse width trigger to search for the extended high pulse in the top example or the extended low pulse in the bottom example, but the interval trigger lets you find both errors without having to change the trigger type. Setting an interval trigger of “rising, greater than 300 ns” will detect both cases. The trigger point is set to the first rising edge after the long interval. This trigger is a combination of the window trigger and the pulse width trigger. It detects when the signal enters or leaves a voltage range for a specified period of time. In the example shown a nominally ±700 mV signal has occasional overvoltages and undervoltages, but we have set the dwell time to “greater than 100 ns” so that only abnormally wide pulses that go outside this range are detected. This trigger detects an edge followed by a specified time with no edges. This is useful for triggering on the end of a pulse train. This image shows the end of a pulse train in which edges normally occur every 2.5 µs. The dropout trigger has detected that no edges have occurred within 4 µs. This trigger is a combination of the Window and Level Dropout triggers. It detects when the signal enters or leaves a voltage range and stays there for a specified time. This is useful for detecting when a signal gets stuck at a particular voltage. In this example the window dropout trigger was set to a 20 µs delay with a +200 mV to –200 mV window. It ignored the pulses, which entered and exited the window rapidly, but detected when the signal remained outside the window for more than 20 µs. This trigger detects a logical combination of up to four of the scope’s inputs. In the image the trigger was set to “Channel A, level, above 0 V, Channel B, level, below 0 V, AND“. The trigger condition became true in the middle of the trace, at time t=0, when Channel A was above 0 V at the same time that Channel B was below 0 V.
The channel A to B (or D, or H, depending on the number of inputs the oscilloscope has) controls have the most options. With level-qualification selected, the channel triggers when above or below the threshold. With window-qualification selected, the channel triggers when inside or outside the specified voltage window. The Ext and AuxIO settings controls have only the level-qualified options. 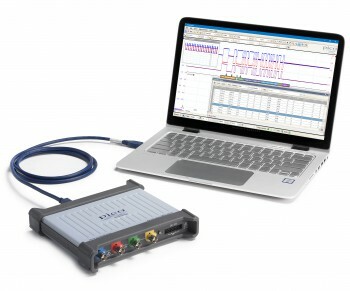 The digital trigger is available on PicoScope mixed signal oscilloscopes (MSOs). It detects a pattern, and optionally a transition, on the digital inputs. Here we set the trigger to look for the pattern 0101 on bits D3…D0. The higher-order bits, seen in the group labelled “16b” at the top, were ignored. The Digital trigger can be fed into the Logic trigger, described above, to allow you to look for composite conditions of the analog and digital inputs. It is worth experimenting with these triggers, as they can sometimes save you from having to search through thousands of waveforms in the buffer.